Michael Katz has run his architectural firm, Katz Architecture Ltd., in Vancouver since 1971, when he collaborated with famed landscape architect Cornelia Oberlander (Library Square, Robson Square) on Marine Gardens. The family housing complex features 70 town houses on less than one hectare, connected by walkways and shared garden space. Marine Gardens is slated to be replaced by towers, but Katz has continued to design innovative new housing models. His latest project is the L41 house, which debuted at the winter Olympics in 2010, and has just recently moved to Science World. Can you tell me about the collaboration with artist Janet Corne on the L41 house, and what you were trying to achieve with the design? Well, Janet is my wife and partner, so that’s the collaboration, and what we were trying to achieve with the L41 house was we were trying to do what hasn’t been done before, which is to use mass-production to build modules for housing…. In effect every product we have—maybe not airplanes and trains—but every other product we have is built in factories … but for some reason housing is not. And one of the main reasons is because they’re too big, so people think of a house as a House, and we decided that if you stopped having that preconception of the house as being very large, and you built it closer to the size of a car, and you took those modules and you put them together, you could solve the problem of mass production—using mass-production to build your houses—which would mean that you could have high design, high quality, and affordability. So that’s where we started was the idea of building very small units. 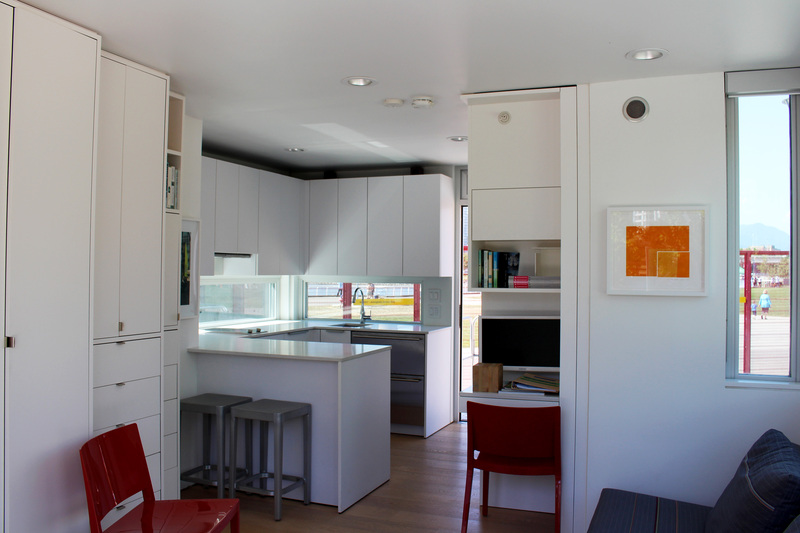 What were some of the things you did to maximize the use of the small space in your design? We didn’t do it that way. We didn’t start with a small space, and then make the best use of it. What we did was the other way around. We designed a house which we felt would work—in other words, a proper kitchen, a living room, which is big enough to have a group of people and a couch, and bedrooms, which are big enough to house a bed, and so on, and bathrooms, which were very compactly designed—and then we measured them, and just made them as small as possible. But not too small, because if you make them too small they no longer are delightful or functional. You mentioned that part of the point was to get to affordability. What are the actual costs of the units? That’s a tough question to answer, because the real answer will come out of the robotics factory production system. Right now all we do is build them by hand, so in small quantities, but when you’re building thousands of them in a factory like you build cars, it’s a whole different equation. So right now they remain just what they are, you know, they cost what they cost, depends on the quality. But just to give you a feel for it, a 408 sq. ft. one bedroom unit—if you build it as a laneway in Vancouver, including the costs of foundations and hookups and so on—will be in the $220,000 range. But that’s still far too expensive for the future. What has to happen before it actually becomes a factory-produced product? Well, we need either a very large order or somebody who’s willing to make a large enough investment, but my guess is that it will start off with larger orders and then we’ll work towards that, and eventually we’ll get to a very large, highly industrialized system. So you sort of touched on this a little bit earlier, but how exactly does the diminished size contribute to the affordability of the unit? All things being equal, the smaller the house, the less materials, the less labour, the less energy, the less city services, and the less land it requires, so therefore the more affordable it is. So I was looking at the sizes you have. You’ve got the 2-bedroom unit at 360 sq. ft. that meets Vancouver’s minimum dwelling size requirement. You’ve also got the 1-bedroom at 290 sq. 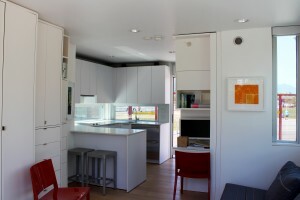 ft., which meets the size requirements for a laneway house, and then you’ve also got the studio, which is 220 [sq. ft.], which from the research I did for my tiny house project, is too small for Vancouver’s zoning bylaws. Correct. But remember that Vancouver’s zoning bylaws are irrelevant when you’re building a world house. What we’re trying to achieve is … what we call a world house. In other words, houses that can be exported all over the world on freighters and trains. So Vancouver’s bylaws are really a trivial part of the overall program. So the way we’ve overcome that is we don’t intend to fight city hall, so we’ll just build the smallest unit that they allow…. By the way, the other thing I should mention: I don’t know if you’ve seen our updated website? You should check it out: l41home.com. But you’ll notice that we’ve broken it up into two lots of units. One is called L41s, and those are the areas you’ve just quoted. They’re slightly bigger because we’re building 8’ x 16’ modules, and a 8’ x 16’ module is 130 sq. ft. if you include the outside walls. 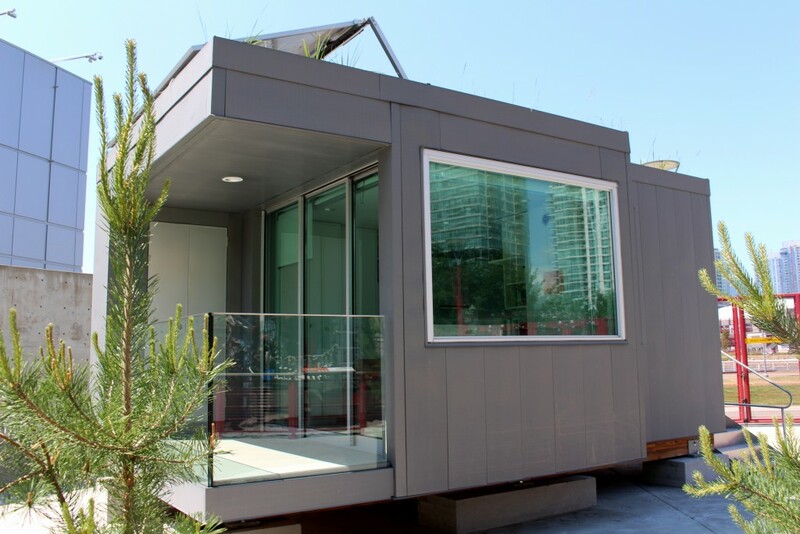 So the studio is two modules, which is 272 sq. ft. A one-bedroom unit is 408 [sq. ft.], etc. Now the laneways are different. We’re also building laneways, and those all comply. So you’ll see we’ve got a laneway for a 25-foot lot, a 33-foot lot, and a 50-foot lot…. Those take the full advantage of the laneway size. In other words, you maximize the size for the laneways. But there are some people who may just want to put an L41 in their backyard, which is just a little unit. So the smallest unit … may not comply, so we’ll just build the 408 sq. ft. one-bedroom unit. Oh ok, so then our little one will comply, we can just add 8 sq. ft. to it. One of the things I found in my investigation of tiny houses is that the biggest obstacle to ownership right now, besides bylaws, is finding land, namely because of the cost of land. I know that some of what you were looking towards was having developers pick this up for apartment buildings, but for homeowners, do you have any thoughts about how the city can look at land in the future to allow for smaller living footprints? As a matter of fact it’s something that I’m looking at as we speak, and that is better use of lots. Now Vancouver’s come a long way already, and that is because what I call a normal standard smallest lot in Vancouver is 33 [feet] by 122 [feet]. There are smaller lots, but generally speaking, the smaller lots are 33 [feet] by 122 [feet]. In the old days they used to have what they used to call basement suites and they were illegal, so people built houses with illegal suites. Then they [allowed] the illegal suites, and then in the bylaw it would refer to the bylaw revolving around illegal suites. So that seemed a bit stupid. So they finally legalized them totally. Then came the laneways. So now, effectively, Vancouver has made a big advance in putting more units on the smallest lot, i.e. they’re allowing three units. The problem is that you’re not allowed to sell those units, so you still need a lot of money because you have to own all three. The next step will be when they allow you to strata them. Once they allow you to strata them, then all of a sudden you can go out and buy yourself a laneway. So that will be a huge step forward, and then the next step, and that’s what we’re looking at…. We’re looking at two possibilities. One is will they rezone it further? In other words, we’ve proposed that they rezone the lost lot on every block. And the reason we’re saying the lost one is because it has a road on two sides, so you can have the extra visitors parking along the 12-foot length, and so they should allow more units on those end lots. Now if you go to our website, and you look under medium density, you’ll see a project there which has 12 units on a 33-foot lot. That was done six years ago, and they were going to build that. The B.C. government [was] going to build that as an exhibit for the winter Olympics, and of course like all government things they never got round to it. So my wife and I looked at each other one day and said, “Well, we’ve run out of time, the only thing we can do is drop the government program and build one ourselves.” And that’s what we did, and that’s how our prototype came to be. So we built the one unit, and that was shown at the Olympics, and in 2011 it was the architectural feature at an interior design show at the convention centre, and now it’s just been moved to Science World. How big is the house you currently live in? Yeah, it’s far too big, but, hey, we didn’t build it, we didn’t design it. It’s a condo actually. Architects waste a lot of space. You know there’s this thing about space … it takes time for people to cut their minds in and actually design the space around what you require rather than what your neighbours have. You can visit the L41 at Science World during their regular operating hours.